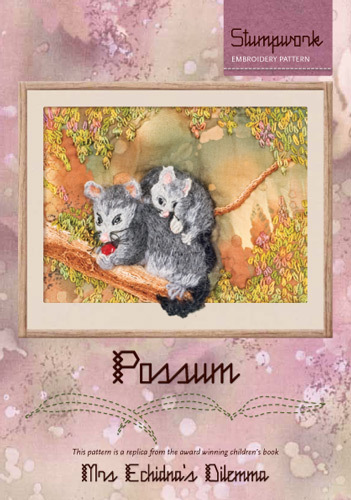 "Possum Pattern" is a replica of one of the illustrations in the book. This particular embroidery is completed in 'stumpwork' or raised embroidery, using a variety of textured threads. This pattern is suitable for someone with some embroidery experience. Stitches used include long and short satin stitch (as thread painting); outline stitch; turkey stitch (also known as gihordes knots); bullions; detached stem stitch. The ears and paws are wired, and body padded, to give a 3D effect. Step-by-step instructions with detailed illustrations are included, together with a clear pattern and complete list of requirements.